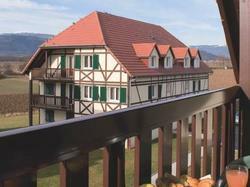 This residence is situated in the Alsatian village of Bollwiller, 30 km south of Colmar. Apartments include free Wi-Fi and a kitchen with dishwasher. A flat-screen TV with cable channels is available in all apartments at Residence Cap Florival. The private bathrooms come with a bathtub and suspended toilets. Apartment kitchens are all provided with a refrigerator, coffee maker and microwave. Guests are free to use the on-site laundry room, which includes a washing machine and dryer. The Bolwiller Train Station is 1.5 km from the residence and the city of Mulhouse is just 15 km away. Residence Cap Florival offers free private parking. House keeping services are not included in the price but can be requested for an extra fee. Flat-screen TV, a seating area and a private bathroom with a bathtub are featured in this apartment.